Brett Miller unofficially captured the Oakshade Raceway UMP Sportsman Track Championship in his very first season in the division. Championships among all three classes on Season Championship night were not determined until the final races of the night. Brett Miller started on the outside of the front row of the 25-lap feature event with a 35 point advantage over Matt Lindsey, who started inside row four. Miller slipped back to fifth shortly after the drop of the green flag as Tim Line took command of the race. Line led the first part of the race after starting on the pole. Brian Fisher closed in and was the leader by lap four and began to check out on the field until the yellow flag flew on lap 18. Rob Liaeff had spun entering turn one which brought out the yellow. Just about at the same time, Joe Smith’s top five run ended as he stopped at the end of the backstretch with mechanical problems. Fisher hugged the inside around the corners and Tim Line tried to find a way to catch the leader by using the high groove. Fisher wouldn’t be caught and won his fourth feature of the year which moved him up past Mike Jessen to third in the final point standings unofficially. Tim Line came home second with Brett Miller finishing the race third and first in the points. Mike Jessen crossed the line fourth and B.J. Gregory was fifth. A big pile up in turn one that involved Rick Dixon, Jamie Grochowski, Tim Mullendore, Billy Brown, Dan Shaffer, Steve Morris, Tony Tolles and Matt Lane brought out the yellow flag just after the field took the green in the Season Championship UMP Bomber A Main. Danny Hogrefe had a slim chance of catching Jim Scout for the championship and did all he could by taking the early lead after starting on the outside of the front row. Scout started 21st and gingerly marched his way up through traffic. After the ugly incident at the start, the rest of the race ran caution-free and Hogrefe collected his second UMP Bomber A Main win of the year. Todd Silvey had another strong run finishing second followed by Joe Cordes. Jim Scout gained 17 positions to finish fourth and unofficially claimed the Oakshade Raceway UMP Bomber Championship. Jerry Signor ended up fifth after also starting deep in the field. Derek Morris put himself behind the eight ball early in the UMP Hornet Feature as he tried to capture that point championship when he made contact with Adam Noonan while battling for the lead. Morris ended up wrecking on the first lap and had to go to the tail for the restart after bringing out the yellow flag. Curtis Spurgeon had to give up second under the yellow to go to the pits to have a flat tire attended to. Drew Smith held the point lead much of the season and took the race lead on lap four. Dylan Herman had jumped the restart after the caution brought out by Morris, but worked his way up to battle with Smith despite knowing the two position penalty was coming. Herman just edged out Smith at the checkered flag, but Smith was initially announced as the winner with Noonan second and Herman third after the penalty for jumping the start was enforced. Adam Noonan was awarded his seventh feature win of the year after post-race inspection found the cars of both Drew Smith and Dylan Herman were not running the same sized tires on all four wheels resulting in both drivers being disqualified. Unofficial Oakshade Raceway UMP Hornet Champion Derek Morris was credited with a second place finish followed by Brice Miller, Dylan Burt and Cody Stetten. Rookie Bob Krumm led the entire distance of the UMP Bomber B Main to earn his first feature win. Jeff Geis pursued Krumm all the way to the checkered flag to end up second. Roscoe Stetten was third with Terry Rushlow moving up from his thirteenth starting position to finish fourth. Bob Mayer started fifth and ended up fifth. The Sportsman Twin 25’s will highlight the racing action on Saturday, September 19 as well as the Celebrity Charity Race III which will raise money for the Susan G. Komen For The Cure foundation in the fight against breast cancer. Among drivers scheduled to compete include defending champ, Norm Van Ness from NBC 24, Ryan Vetter from WTOL 11, Cliff Smithers from K100 radio, Wauseon Mayer Jerry Dehnbostel and Mr. January in the breast cancer calender Jon Eaton. Chrys Peterson from WTOL 11 will be the Grand Marshall for the event. The UMP Bombers and UMP Hornets will complete the racing action. Gates open at 4pm with racing at 7pm. Oakshade Raceway hosted its final American Late Model Series (ALMS) event of the year as the 2009 racing season begins to wind down. Jon Henry, the ALMS point leader, added to his point lead over Brian Ruhlman after picking up the victory Saturday night and taking the check for $2,000. Henry started on the pole and got the initial jump at the drop of the green flag over Matt Miller, who has three Oakshade Raceway feature wins this year, but Miller got by Henry before the completion of lap one. Miller then began to pull away and appeared he might be on his way to another feature win. Jon Henry would spoil that plan as he began to close back in on Miller while the duo worked through lapped traffic. Henry reclaimed the lead just past the halfway point of the 30-lap feature event. Henry continued to wheel the Halcomb Racing machine through the lapped traffic while maintaining his advantage over Matt Miller all the way to the checkered flag in an event that went caution-free. 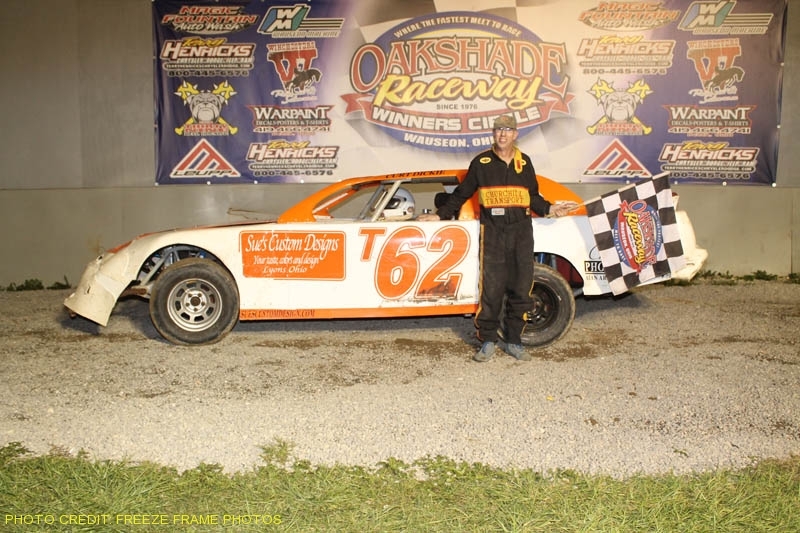 It was the Ada, Ohio driver’s fifth Oakshade Raceway UMP Late Model Feature win. Matt Miller had to settle for a second place finish behind Henry. Dona Marcoullier was probably hoping for a caution flag late in the race after he had worked his way up to third and was closing in on the race leaders. Marcoullier ended up finishing third ahead of Brian Ruhlman and Rusty Seaver. Tim Line opened up a big lead early in the UMP Sportsman Feature event, but Mike Jessen reeled him in and took the lead on lap six on his way to his third feature win of the year. Rusty Smith had a great run going until he spun after trying to get to the inside of Oakshade Sportsman point leader Brett Miller for the second position with two laps remaining. Jessen held off Miller the final two laps and the point leader settled for a second place finish. Tim Line ended up third with Matt Lindsey and Brian Fisher rounding out the rest of the top five finishers. Jeff Foks led the entire distance of the UMP Bomber A Main to pick up his first feature win of the the year. Danny Hogrefe caused a bit of excitement when he got crossed up exiting turn four in front of a lot of oncoming traffic. Among the drivers caught up in the incident were Jeff Geis, last weeks A Main winner Todd Silvey and Oakshade Bomber point leader Jim Scout. Dan Shaffer put some pressure on Foks at the end of the race, but second was the best he could do once the checkered flag waved. Australian driver Brad Blake finished third followed by Terry Rushlow and Craig Dippman. The youngsters in the UMP Hornet Feature event event ran a clean race with no caution flags. Derek Morris took command early in the race and never looked back. Fourteen-year-old Morris went on to win his fourth feature event of the year and took over the point lead from Drew Smith who failed to start the feature event. Dylan Herman barely fended off a challenge from Adam Noonan for second at the checkered flag. Curtis Spurgeon finished fourth and Josh Froelich was fifth. Curt Lancaster started on the outside of the front row of the UMP Bomber B Main and maintained the lead throughout the entire event despite multiple caution periods. One of which came out on lap six when Roscoe Stetten got sideways coming off turn four and was tagged by Jamie Grochowski who had nowhere to go and almost pushed Stetten’s car over on to its side. Lancaster was followed by Kyle Light, Karl Spoores and Chris Williams who started eleventh. Marty Bloomer finished fifth. The UMP Bomber C Main turned out to be a race of attrition with only a handful of cars circling the track at the end. Robert Meinen was chasing Justin Gamber for the lead when he fell off the pace and rolled to a stop in turn two ending his night with a push to the pits. In the end, Gamber found his way to victory lane. Also surviving the race were Jack Garland finishing second, Jeff Goodman third and Devin Goodman fourth. Rob Kast ended up fifth. Tracks champions in the UMP Sportsman, UMP Bomber and UMP Hornet divisions will be determined on Season Championship Night this Saturday at Oakshade Raceway. Gates open at 4pm with racing at 7pm.